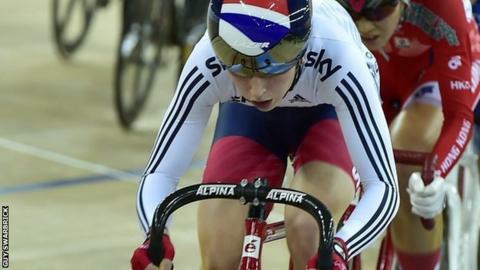 Laura Trott won the omnium to claim her second medal of the UCI Track Cycling World Cup in Hong Kong. After winning silver in the scratch race on Friday, the 23-year-old Briton beat American Sarah Hammer on Sunday to win the multi-discipline event. Mark Cavendish was fourth in the men's omnium in his first World Cup meeting on the track for seven years. He will now have to wait to see if he is selected ahead of Jon Dibben or Ed Clancy for the World Championships. The 30-year-old was happy with his performance. "I'm really pleased, personally," Cavendish told British Cycling. "I did better than I thought I was going to do. I'd have been happy with a top 10 here. "It's been a great group atmosphere - we've won the weekend, won the World Cup overall so it's nice to be a part of that." Jason Kenny completed a successful meeting with his second medal, a bronze in the sprint, to add to his gold in the team sprint. Britain ended the final World Cup of the season top of the medal table with eight medals as they prepare for the World Championships at the London 2012 velodrome in March and the Rio Olympics in August.